Dental implants have a variety of use. The most common is to replace a single tooth which I will discuss here. 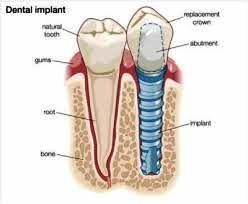 An implant replaces the root portion of a tooth and is placed into the bone. An abutment is screwed into the implant and a crown is cemented on top. When I meet a new patient who is interested in an implant tooth replacement, I will complete an exam of the area both visually and with an x-ray. Here I diagnose why your tooth has to be removed, treat any infection and evaluate your health history to make sure you are a good candidate for an implant. Then I will refer you to one of my surgeons for an implant consultation. My office will send a copy of your x-ray and the referral. I will also go over a treatment plan that discuses cost with you. If you have dental insurance we can pre-authorize our treatment for you to see what they will cover. I will also discuss your options for the space that you will have once the tooth is removed and the implant is healing. If you tooth is still present and not infected, often the tooth can be removed and the implant placed in the same visit. If there is infection, the tooth is removed and the bone is allowed to heal for six months before the implant is placed. When you meet the surgeon, they will also look at your health history, x-rays and the area of concern. Often they will take a CT scan, a three dimensional image of the jaw. This is to assess all the structures nearby such as nerves and sinus spaces for selecting the proper sized implant. They will present a treatment plan for your work and also discuss options of sedation with you. This appointment is a great opportunity to ask any questions that you have and make sure you are comfortable with the process and the cost. 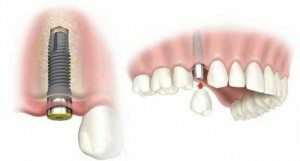 At your surgery appointment the tooth will be removed and if possible the implant will be placed. A healing cap is screwed into the implant for healing. (see left illustration below). The surgeon will see you for a follow up appointment a few days after surgery to assess your healing and review care instructions. Over the next four months the bone will strengthen around the implant. Once the implant is strong enough to support a tooth, my office will scan or impression the implant and gather the necessary information that will allow our laboratory to fabricate the final crown. After three weeks you will return to my office for placement of the abutment and the crown. (see illustration above on the right side). At the delivery appointment I will remove the healing cap, place the abutment and crown and evaluate the fit of each. I will also make sure the biting force is balanced on the crown and the tooth looks good to you and me. Once they pass inspection, I will use a special device to permanently tighten your abutment and then the crown is cemented. I will also review how to care for your new tooth. To ensure a quality result for you, I work with a pool of surgeons that have great knowledge and reputations for their work. They also have proven success rates for their implants. There are many brands and types of implants on the market today. I work with Straumann, Biomet 3I and Nobel Biocare: the leaders in implant technology. Implants can also be used to replace multiple teeth or to support removable partial dentures or full dentures. We can discuss that at another time! Below are links to implant the implant companies I mentioned – it will take you to their patient education section. Here you can watch videos and receive more education. Feel free to contact my office with any questions or if you want to have a consultation. Next Post: Why Do I Need A Root CANAL? ……AND What IS a Root Canal?